I am back! With a review! Oh, the wonderful things I have in store for you, internet-people who like reading my words! I was dreading reading Preloved. I find this happens pretty often to me. I find out an author I love has a new book coming out, and I am excited! I read the blurb and see the cover, and I am even more excited because it sounds like exactly the kind of book I would love! I get my hands on aforementioned book! And then I stop. 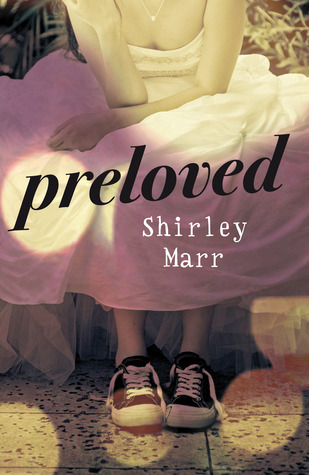 And this is what the author herself says about it: Preloved is a ghost story. It involves past lives. It's about a modern teen girl and a dead teen boy from the 80s. It's more a bad romance, less of a love story. And it's more abnormal than paranormal! Since it references the 80s, it might also have stonewash denim and a Choose Life t shirt in there somewhere too. I hope it's funny and dark and sweet in its own indie way. As much as I enjoyed Fury, Marr's debut novel, Preloved is definitely my favourite of the two, for a couple of reasons. One being that while I think it's fantastic that there's lots of dark novels for teenagers to read (it's a dark time in their lives! etc, etc), my personal tastes seem to be evolving away from that (I don't know, I think my brain may have reached capacity on books read about murderous teenagers). Preloved does have its darker points and its serious subject matter (like, super-super-serious subject matter), but there are a lot more funny scenes and heaps of fabulous snappy dialogue and on the whole, it's a lighter read than Fury is. It's very well-balanced. I loved how meta the entire novel was. References to YA novels while inside a YA novel are hilarious. I loved that it was 'more abnormal than paranormal'. As I read it, I imagined it as an eighties teen rom-com the entire time in my head. And it was great. The novel was, too. Big-time Hollywood film producers, who I know are definitely for sure reading my blog, take note. I'm thinking about the casting at the moment. Just as suitable for younger YA readers as older ones - the writing is unassuming and straightforward and nothing is particularly inappropriate, though there are some heavier themes (well, someone had to die in order to become a ghost). Very much recommended if you like paranormal novels and/or 80s nostalgia. Don't let the paranormal aspects scare you off, though - it's a very lovely ghost story. In other news, if rambling were an Olympic sport, I like to think I would at least make the finals. END REVIEW.